The story with two endings. Just a warning, this will be a long blog, you might want to get a cup of hot tea before you start reading! I won’t include every detail of my trip, but I will give you a short (or not so short) overview of all the things that you can see in less than 72 hours. I must warn you here though, since in our relationship A is usually the drama queen and I had no internet access and no other ways to communicate with him, I will for now take over the drama queen part. I will make it easy on you and take the suspension away right now: My trip could have easily ended with me dying. I encountered at least 17 scenarios that easily could have ended with my demise (and I will proof that to you!). 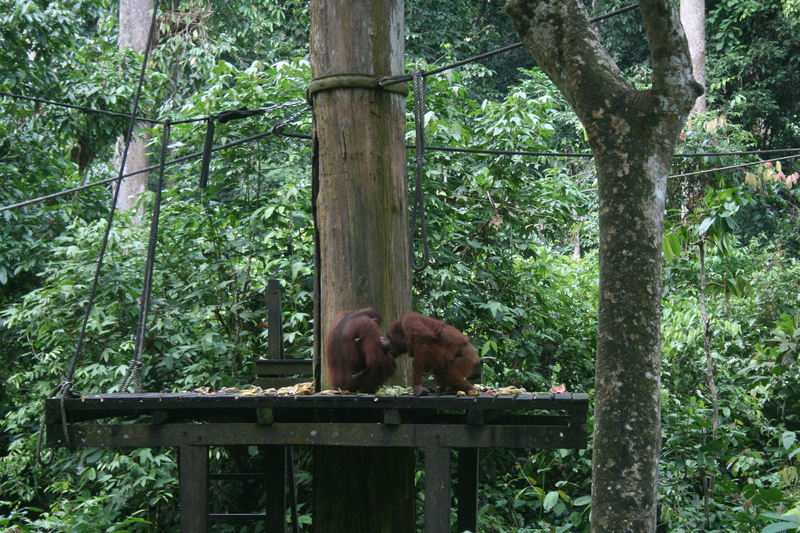 Thankfully, it didn’t, so I will tell you now the other end of the story: I had the time of my life in Borneo. It wasn’t just vacation for my body but it was better than I ever imagined in my wildest dreams. This trip started with me having to get up at 4 am on a Monday to catch my flight. 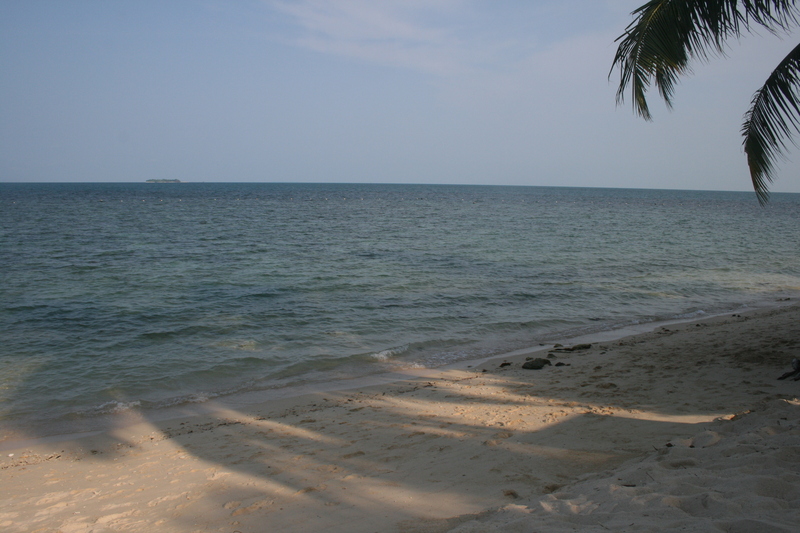 I had arrived in Kota Kinabalu a couple days before, enjoying sitting at the beach and summer dreaming. But that morning I left my room with all my belongings and found a random cab stopping right in front of the hotel’s front door. So naturally I figured, it was there for me (although technically I had no reason to believe that it was, since I didn’t call a cab). In a short conversation, I basically hijacked the cab from it’s original customers, as I found my stuff put away in the trunk. A few minutes later I was greeted by the two men in worker’s uniform that actually had called the cab. And I don’t mean to sound stereotypical, but if you are in a cab with three strangers, barely speaking English at 5 am (the sun was not even up) in the middle of Malaysia, your mind races a million miles an hour and you realize that this is number 1 of the possible death sentences, right there. Thankfully, the worst thing, that happened on that ride was that the cabdriver really felt the urge to hug me. Apparently I am hug-able (crises averted). The second possible death sentence was the flight from Kota Kinabalu to Sandakan. The airplane was from the 50ies (if that) and it didn’t withhold the strong winds as well as I hoped it would. These 50 minutes up in the air were extremely terrifying. And I knew, that only a drop of rain, could mean that the plane could be plummeting into the depth of the jungle. Upon arrival I was greeted by a little man, who had my name written down on a sheet of paper. He instantly told me that he had a tumor in his throat and I was really confused and also very touched that he would share such personal information with me. I also wasn’t quite sure how to respond, so I asked if there were elephants in the jungle, which then led to a 45 minute lecture about how little we know about the Pygmy elephants and how there is no guarantee for a sighting. This lovely guy took me to the departing dock and I was instantly put on a little boat. I swore to myself, if I saw any water in it, I would not board. I did not trust this thing. Upon thorough inspection, I concluded that the boat was safe. However, nobody told me, that once at sea, the boat would slowly fill up with water, and I mean not a few drops, but buckets. This was the third time, in less than 3 hours, that I saw my life ending before my eyes. After about an hour we made it to turtle island, where – I have to admit – were no actual threats. Other than a little black tip shark cruising the shore of the beach while I was in knee deep water, only inches away from him (or her). Oddly enough though, that left me more excited than anxious and I snorkeled for about 4 hours, trying to see if I could find him/her again, I didn’t and neither did he find me, although I guess that’s a good thing. Technically that’s sentence 4 though. That afternoon I got to witness the single most awesomest thing, that I have ever done, other than saying yes to marrying my best friend (I have to throw that in here…). Turtle island doesn’t actually have anyone living on the island. 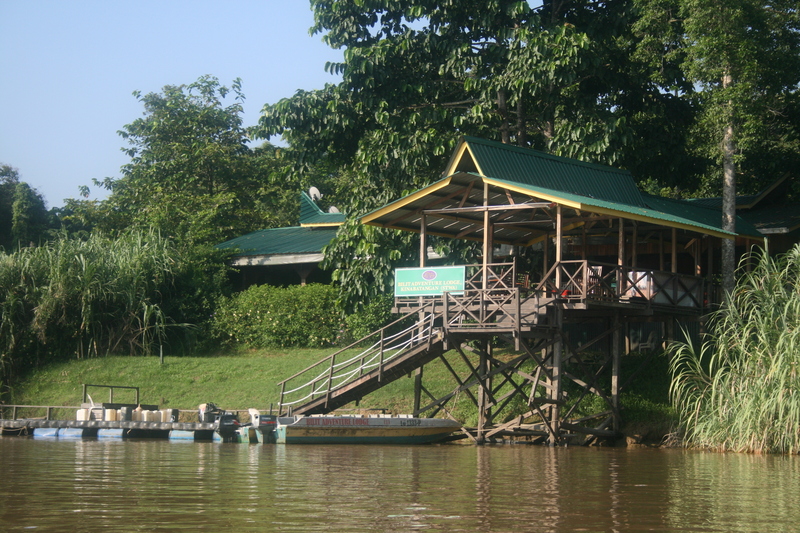 There are a few chalets for adventurous tourists, these are being cleaned by a few staff members, but other than that the island is not actually inhabited. 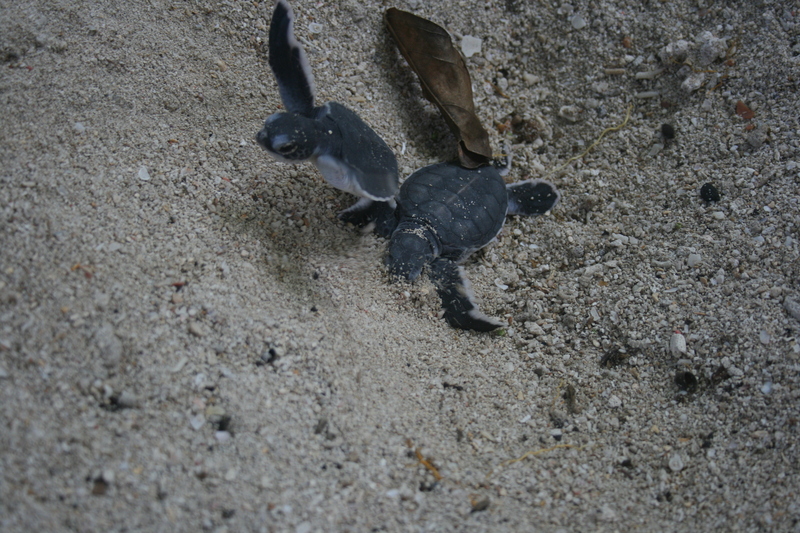 But for turtles, it is the place to come to lay eggs. 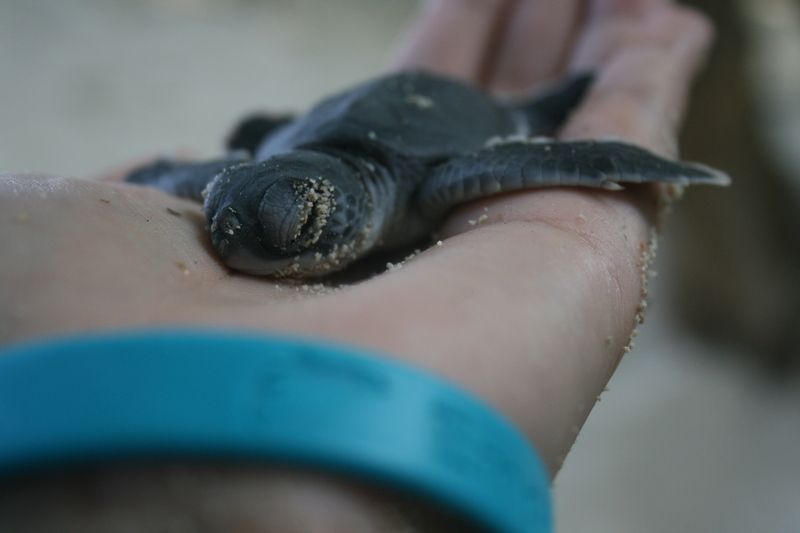 After 45 days little turtles start to slowly emerge from their ping-pong ball sized eggs. Once they break through the shell and dig their way through the pit of sand that they have been basking in, they run to the shore and swim for their lives. – Literally. Only while watching this little fellow resting in my hand for about 15 minutes (I washed my hands before, so I wouldn’t get sunlotion or bugspray on this little guy), did I in a conversation with the police find out, that because of the Philippines and Malaysian conflict, that there are constantly 30 police men on the island protecting the tourists. If I would have known that before… Well, I probably still would have come, but this was number 5. Later that night I witnessed a mother turtle lay her eggs and all I wanted to do, was lay next to her and encourage her, tell her she did a good job. I highly doubt though, that would have helped the situation, but she was a true warrior. You could see that she was exhausted and that having to lay 110 eggs that night, took everything out of her. 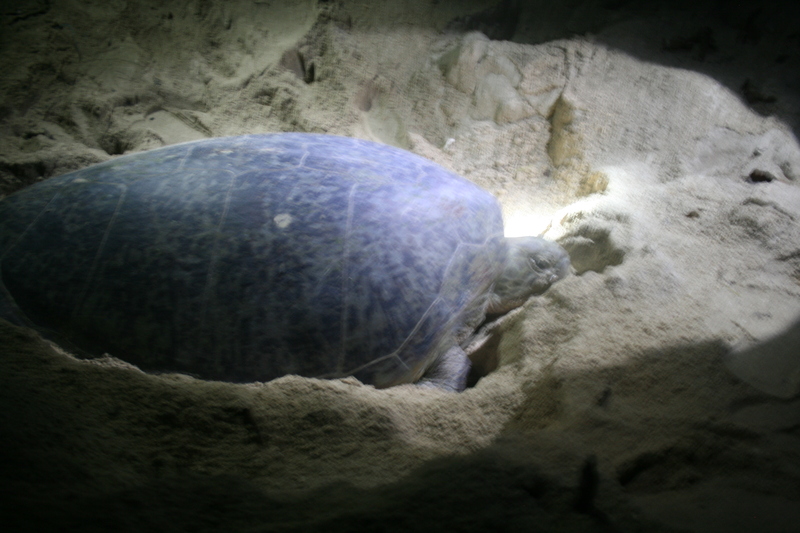 After she was finished laying her eggs, she laid in the sand and rested before she continued her journey back to the ocean. That night I went to bed with a heart full of love. I always knew, turtles were awesome, but when you get to come so close without invading them, that is pretty special, if you ask me (sorry about the shaky picture, but you try not getting quietly excited seeing this magnificent creature). 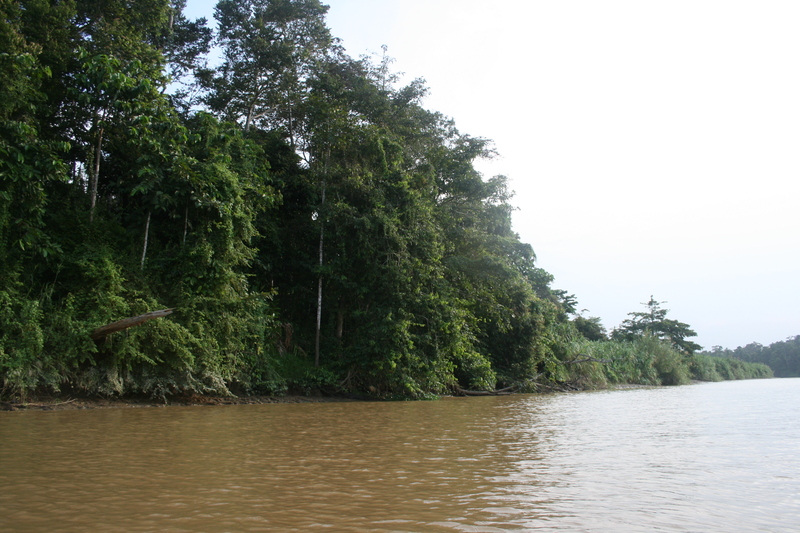 The next morning I was brought back to the mainland (death sentence 6, since it was the same boat) and then I was asked to board a car, that would bring me to an orangutan sanctuary, where we could watch some orangutans in the wild. And I don’t know if you have ever driven on Malaysian roads, but if not: it’s not fun. It’s basically a roller-coaster, but one, that you do not sign up for, one that makes you take out the sick bag, before you even sit down (#7). Especially if your driver is “ambitious” and thinks he is Michael Schuhmacher. He is not, nor will he ever be. Once we arrived at the Sepilok sanctuary, we were greeted with a very alarming warning: Don’t get too close to the orangutans. They can rip you in half (#8). And although, that might be true, these two mothers make a very different case: One of them having just given birth a week ago and the other one having given birth about 4 weeks ago. And the more experienced mother petted the new mommy on the head as to say, that it would get easier and then she kissed the little one, just like I would kiss my little niece. And then they sat next to each other eating, while we all awed, sometimes you discover kindness in the funniest places. 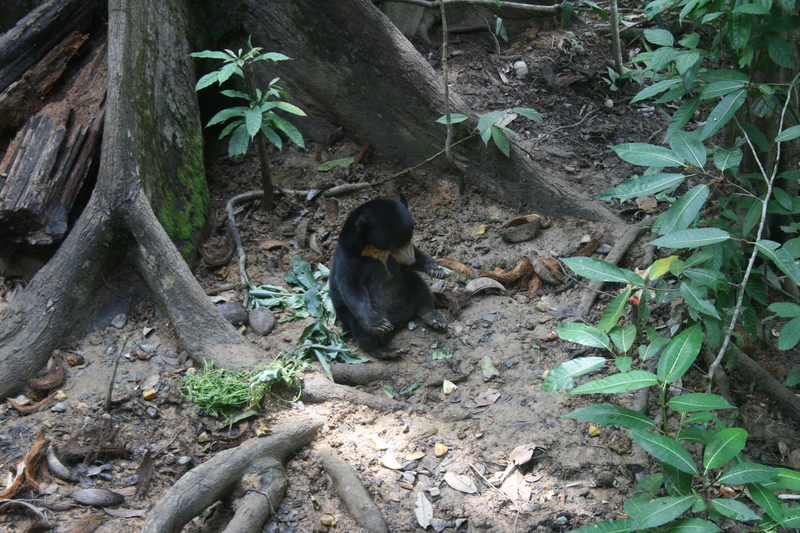 After that we headed to the sunbears. Their sanctuary has just recently opened and has a lot of room for improvement, but either way, this new home, is indefinitely better than them being caged up in small places where they are held as pets. It was very impressive having such a wonderful establishment in the middle of nowhere in the jungle along Sabbah’s second longest river. I was greeted by 107 mosquitos and two cats that would not leave my side. After some quick refreshments, we were told to board the boat again, this time for 3 hours (if you ask me, that should count for at least 4 more death sentences, but I will leave it at #11). 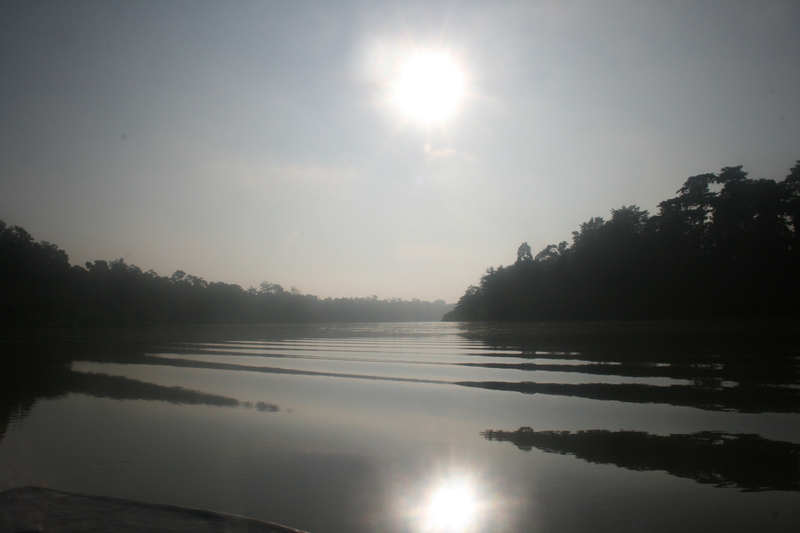 Now, I don’t know if you are familiar with Borneo but the jungle will give you plenty of opportunities to observe the rich wildlife, among pygmy elephants, many types of birds, many different species of monkeys, crocodiles and all kinds of snakes. And although the wildlife is breathtaking, the view was even better. I survived without a personal crocodile encounter, but sadly also without any elephants. That night I was invited to do a night time jungle tour and being always open for new experiences, I agreed instantly. I was told to put on leech socks (unheard of!) and rubber boots. And off we went into the dark of the jungle. And let me tell you, dark does not equal dark. There is city dark, night time dark, ocean dark (just to name a few) and there is jungle dark. 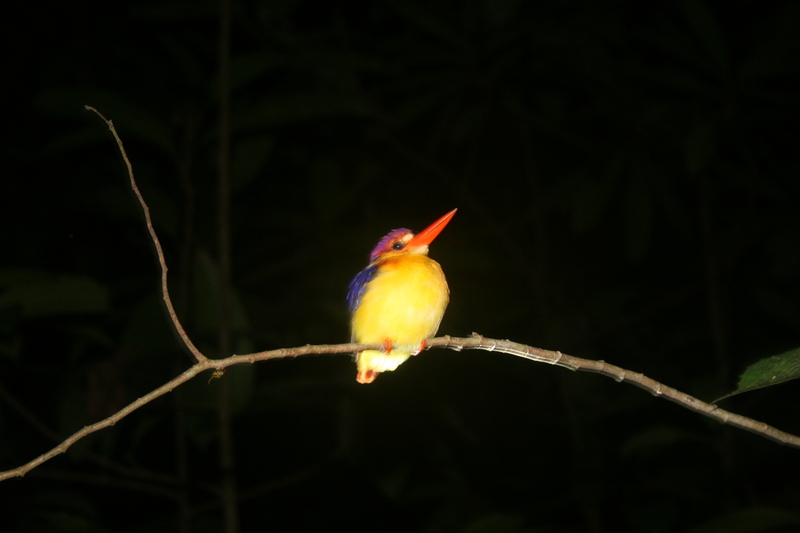 Birds don’t fly during the night, because they can’t see, which made it possible for me to capture this little kingfisher. But it also meant, I couldn’t see anything else other than what my tiny flashlight would allow me to see (lots of falling over tree stumps, getting bitten by insects and lots of darkness). But the darkness of the jungle is one, that captures you. Because you know, even though you don’t see anything, you are seen by many things. For instance a juvenile leopard that out of nowhere stops in front of you. That happened (#12). And if my hands wouldn’t have been shaking and my knees trembling with fear, I would have probably attempted to take a picture of him. Somehow we made it out of the jungle alive, not being bitten by leopards or leeches, but yet hungry for more wildlife. The next morning I had to board the incredibly unstable boat again (#13), I want you to keep in mind that there are crocodiles in the river, that without a doubt could have entered the boat, eaten us alive and we would have never had a chance. Not even the life vests would have helped us. But then again, this view kept my mind off the living things in the murky water. 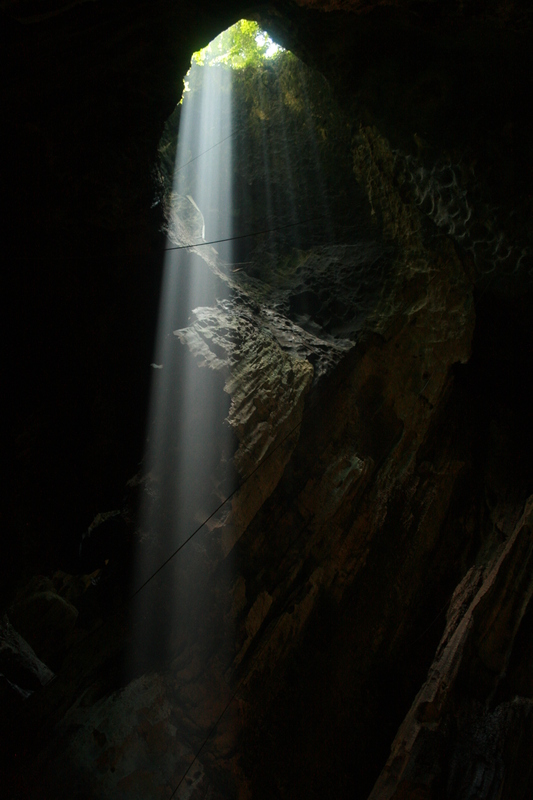 I then was transferred to the other side of the river and took the car (#14) to the Gomantong caves. Here birds make their nests with saliva an then some poor confused souls cook that and eat it as a delicatesse. Say what you will, but bird’s nests in my book are made to lay eggs, not for eating, simple as that. In addition to an undefinable smell (due to bird and millions of bat droppings) I had to deal with cockroaches and I don’t mean the ones that secretly hide behind your fridge but the ones that Spielberg turns into your worst nightmare. Numbers? Well more than 2000 and I would still not be anywhere close to the actual number, seriously. And whether or not they were a threat to my life, I do count them as #15. After I barely survived the invasion of cockroaches, I was dropped off at the crocodile park and here I want to make a strong point to discourage you to ever going there. And I know, that this sounds like I am being a hypocrite, because why did I go if I urge you not to go? Well, I went against my better judgement. I KNEW that this place would be sad, I KNEW that my heart would bleed out for the animals in this place, especially after seeing their natural habitat. I KNEW that this was not a good idea, the second I stepped in, but I HAD to see it. Because this is what I am working against. I am working for freeing them, but how can I free them if I don’t see where and how they live? And I know, this is no justification, because we should free all caged animals and put them in their natural habitats, but these pour souls will never know what the real river water will feel like on their skins. 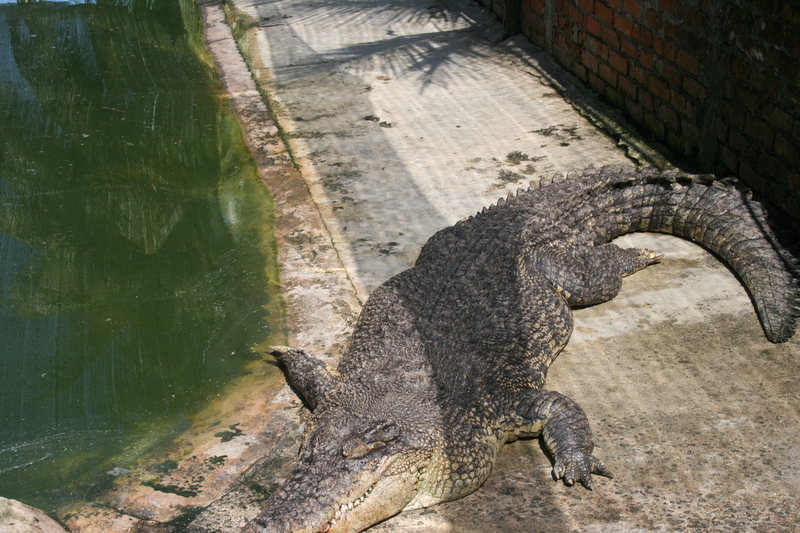 I am sure there were at least 50 crocodiles and their enclosed spaces were just that, enclosed. Not big enough, not good enough for these majestic creatures. And I say that, because there was more than once, when I knew, that if the crocodile wanted, it could have gotten me or anyone else for that matter (#16). And I suppose the animals to a degree knew that too, but wouldn’t you lose your fight for freedom too, when you are pressed in into a depressing place? If you decide to go, bring a strong stomach, bring a good hearted soul and let this be a lesson to you. One that should make you think, one that should make you realize, that a person is a person, no matter what size, what form or what shape and that animals, although no voices that we understand, still have voices. All animals deserve the same rights as we do. How can we not give them the same rights? Especially when they are so gorgeous? That night I made it back to Kota Kinabalu. The airplane was, to say the least, very scary and unbelievably unstable (#17). And my heart was heavy, although happy to having been able to experience the jungle in a way that I never thought possible, I also learnt a lot of valuable lessons. For instance crocodiles can move their eyelids independently from each other and I don’t know why that was such a surprise to me, but as I was being watched with one eye by a crocodile, I realized that she was too lazy to keep both eyes on me. I learnt a lot about turtles and monkeys and birds and orangutans… And I learnt that no matter where you are, you can always find something incredible, you just have to open your eyes and allow yourself to experience it.